This was a piece that I wrote sometime in my junior year of high school discussing my thoughts on morality systems in video games at that time. Like the games themselves, my views on these systems have changed. Nonetheless, the points I raised in this piece warrant discussion. Since their inception, narrative-focused role-playing games (RPGs) have concerned themselves primarily with player interactivity with the game-world and the freedom to interact with virtual worlds and their inhabitants in any number of ways. Inherent to this aesthetic of immersion is player morality and his/her relationship to the artificial inhabitants of these virtual worlds. In the past decade, a scintillating crop of games has arisen from studios such as BioWare and Obsidian; these games turn morality into a central mechanic through which fun is derived. By presenting an ethically ambivalent game-world wherein player choice dictates the very fate of these virtual worlds, questions of the reward-punishment nature of these games, as well as the games’ strongly deontological inclination arise. Morality in video-games is thus a rather problematic aesthetic with its own share of contradictions in player-agency, subjectivity and moral absolutism and relativism. 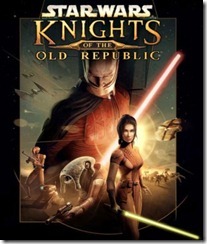 BioWare’s Star Wars: Knights of the Old Republic (KOTOR), while not the first game to have had an integrated morality system, has one of the most historically significant. The game immersed its players in a rich sci-fi universe set 4000 years before the events painfully depicted in The Phantom Menace. Its narrative revolved around the adventures of an amnesiac republic soldier trying to prevent a great evil from unleashing an ancient superweapon. The game carried with it a great sense of player-freedom, allowing the player to approach story-situations in any number of ways. When on a mission to rescue hostages from a Sand People enclave, one is given the choice of killing the Sand People and saving the hostages or trading moisture vaporators for the hostages. While this concept of player-agency is admirable, the stark black-and-whiteness of the game’s philosophical position seems rather shallow and un-nuanced. Perhaps what made KOTOR such a great game was its consistent ability to give the player the illusion that his/her moral choices had major consequences and ramifications. The strong writing gave the player an illusion of importance, and despite the superficiality of the player’s actions in the real world, the decisions that the player had to make had real weight and impact on the gameworld and how NPCs (non-player characters) react. Nonetheless, how NPCs react to the player and the direction of the ludonarrative (the part of the game story that the player can control) and subquests seemed to be the only impact that the player had on the game. Ultimately, KOTOR still follows a fixed linear narrative with multiple endings. No matter how good or evil a player is, the game will always reveal its major twist on the Leviathan, and it will always conclude with an epic showdown on the summit of an ancient space-station. While NPC perception and ludonarrative nuances could be impacted by the player, KOTOR lacked the range of narrative and moral dynamism expected from the best RPGs. As a result, KOTOR’s vision of moral freedom remained rather constraining in comparison to other games. Perhaps the most appalling ramification to come out of integrated morality systems in role-playing games is the starkly deontological approach to ethics that these games take. 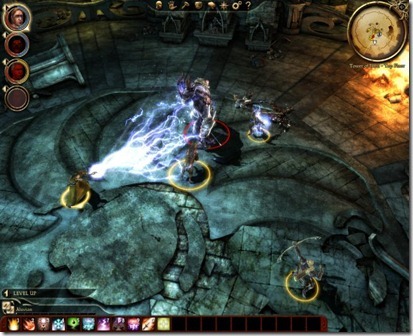 (NOTE: I by no means mean intend to portray deontology as a black-and-white affair in this post, ethical approaches in reality represent a more nuanced balance between deontology and teleology, these games however, seem to take a stance of moral absolutism) In the vast majority of morality-centric games, a player’s ethical choices take the place of a sliding “morality meter.” Player actions add or subtract points from the “morality meter” and depending on where the player stands on this “morality meter”, specific dialogue options and narrative paths might open or close. 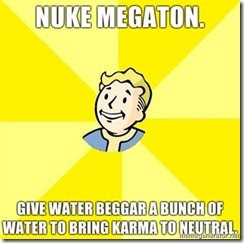 Fallout 3 puts this mechanic in the form of “Karma Points” and Mass Effect in its “Paragon/Renegade” system. The sliding “morality meter” mechanic represents an overly absolutistic approach to ethics that ultimately renders choices as black and white, universal laws being given without understanding or context(albeit, most such games draw such universal law from the real world). By rewarding or removing morality points from the meter, the game developer essentially decides what is moral and what is immoral. Thus, being an ethical person in these virtual worlds requires absolute conformity to the universal laws set forward by the game developers. Dissent from the moral norms established by developers results in punishment by morality point loss. While in other genres this may be acceptable as it expresses the developer’s worldview on ethics, in a genre as grounded in the mechanics of self-expression, exploration and moral freedom as the RPG, this sense of deontological moral absolutism is heavily problematic. Spoilers ahead. At the climax of Fallout 3, President Eden gives the player a vial of an anti-mutagen agent to insert into Project Purity. The anti-mutagen agent will eliminate all Super Mutants and Ghouls from the Capital Wasteland, thereby restoring the area into a pre-war state. The game considers this to be an immoral decision and deducts Karma from the players that take this course of action. The moral decision in this case would be to sacrifice oneself in order to activate Project Purity without the anti-mutagen agent, giving purified water to mutants and non-mutants alike. In this context, Bethesda, developer of Fallout 3, advocates a Peter Singer-esque form of utilitarian altruism, that philosophical worldview being the universal law that the game advocates and judges its players actions on. Approaching Fallout 3’s situations from any other kind of ethical worldview, say, Randian Objectivism, could result in the player losing Karma for an action that they believe to be moral. Fallout 3, a game which in many ways, offers unprecedented freedom to the player, ultimately judges the citizens of its virtual world by its own categorical imperative. 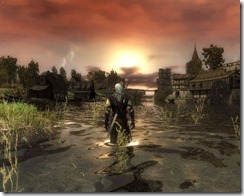 While the player might be free to “be the bad guy,” the philosophical motives of the player remain rigidly entrenched in the beliefs of the developer. A great ideological conflict between gamers and game-developers arises over the definition of morality. Even then, a totally teleological approach to ethics would defeat the purpose of morality being a central mechanic in role-playing games, relegating gameplay to no more than moral relativism. How then, can a logical balance be made between ethically challenging gameplay without demanding the player abide by unfamiliar ethical systems? 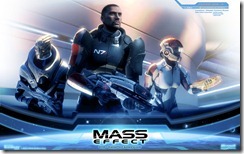 Bioware answered this question by offering a wider range of possible quest-arcs and endings in Knights of the Old Republic and Mass Effect, each of the possible paths of action offering its own pros and cons and none of them offering a specifically clear-cut ultimate good or bad decision. One KOTOR side-quest revolves retrieving a runaway droid for a mentally unstable owner. Upon finding the droid, it argues that his escape was for the good of its owner, who had grown anti-social and insane upon growing overly dependent on its companionship. 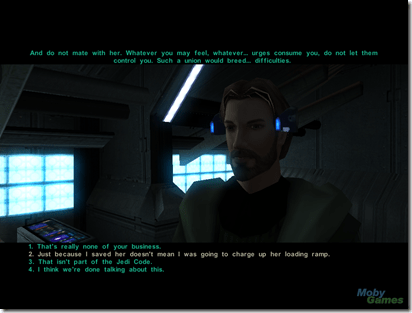 At this point, multiple Light-Side solutions can be reached, allowing for the player to express their view of the situation through their own moral perspective. One can kill and loot the droid for Dark-Side points, release the droid and hope the owner can become socially independent or capture and return the droid to its owner. While the outcomes remained black and white and the conditions players are judged by strictly deontological, the player is given a degree of flexibility to explore the nuances of moral dilemmas. Other recent games have aggressively distanced themselves from moral absolutism. Another BioWare game, Dragon Age: Origins, addressed the problem by making its moral choices “aggressively grey.” Atari’s The Witcher (both games I have not yet had the opportunity to play) was marketed on “shattering the line between good and evil in a world where moral ambiguity reigns.” While deontological/absolutist games might squelch out dissenting worldviews with their view of “universal principles,” games that experiment with a teleological ethic remain just as problematic. 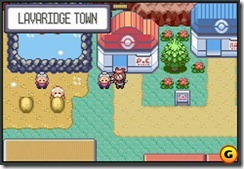 Ever since playing Pokemon, the role-playing genre has always been my favorite type of game. 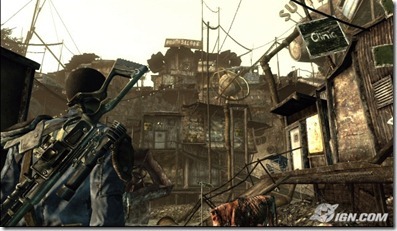 Fallout 3, in particular, stands out as one of the most immersive and engaging experiences I have ever had in a game. However, the root mechanic in the role-playing game is “role-playing,” that is treating the game world as our own and acting as a citizen of these virtual worlds. In order for these games to matter on a philosophical basis and be more narratively engaging, game developers need to re-evaluate the moral systems implicit in their games and the philosophical, not just moral, freedom that they offer.